During the 2016 presidential election, Facebook, Twitter, Google, and Microsoft all hired dedicated teams of partisan staffers to work one-on-one with campaigns to target voters. UNC journalism professor Daniel Kreiss explains their motives in a first-of-its-kind study. Dozens of people crowd around a glass-enclosed bar in Philadelphia, chatting and sipping cocktails while others immerse themselves in the virtual worlds provided by an Oculus Rift headset. Across the room, others line up to participate in a Facebook Live broadcast and stare at large screens streaming real-time Instagram posts while they wait. This is not a social media convention. This is Facebook’s meeting space at the 2016 Democratic National Convention (DNC) in Philadelphia — not merely a center for presidential nominees and political debates but also a hub for tech companies. 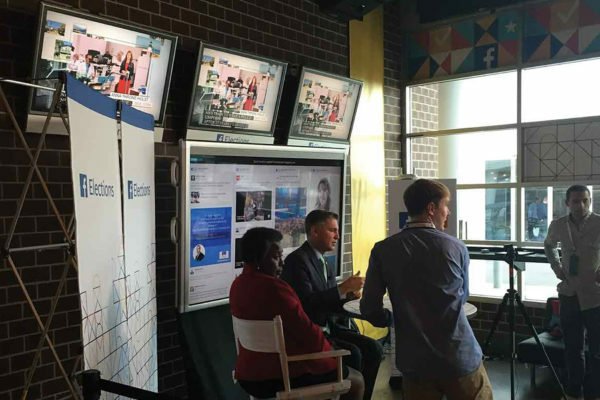 Facebook hosted a live broadcasting space at the 2016 Democratic National Convention. “I had never heard of technology firms working directly with campaigns so extensively,” admits Daniel Kreiss, a UNC journalism professor who’s spent the past decade researching political communication. In 2016, Kreiss led a team of researchers to the DNC in Philadelphia to meet with delegates and digital directors to learn how campaign organizers were utilizing social media at the convention. They got more than they bargained for. Kreiss’s curiosities about it all began to drive his research in a new direction. Why would these technology firms want a presence at the DNC? Why spend the money to attend and place senior employees in the middle of the action? What sort of work could they possibly be doing? 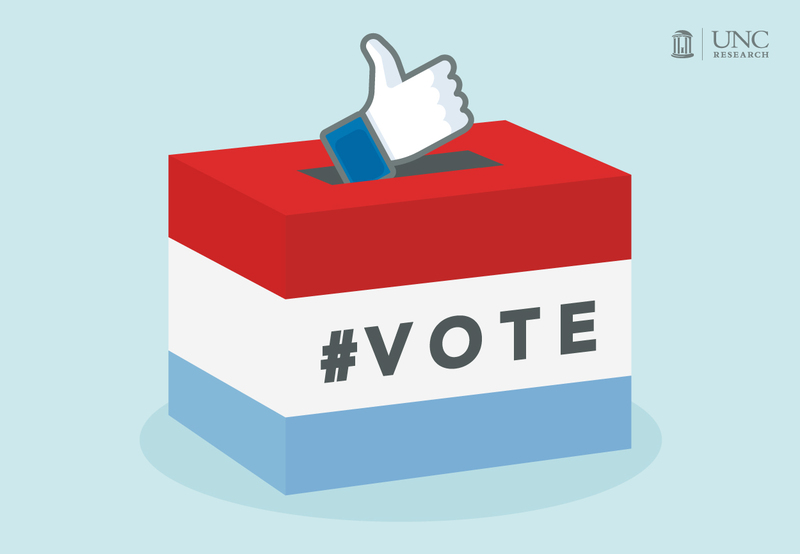 After conducting in-depth interviews with 14 senior-level digital staffers and representatives from Facebook, Google, Twitter, and Microsoft, Kreiss and Shannon McGregor, an assistant professor of communication at the University of Utah, discovered that these tech companies work behind-the-scenes with campaign organizers to not only uncover which voters to target but how to create custom content to reel them in. As it turns out, these firms take on a strategic advisory role and even hire staff with backgrounds in Republican and Democratic politics to create personal, trustworthy relationships with political campaigns. Political candidates, especially presidential ones, draw the eyes of millions during election years — and tech companies all want that attention, too. Representatives from the firms surveyed told Kreiss and McGregor that their involvement with candidates gives high visibility to the platforms they represent. They also believe that developing and maintaining positive relationships with candidates, elected officials, and journalists places them in the good graces of people with the power to regulate them in the future. These firms offer candidates a wide range of services. Facebook, Google, and Twitter focus on content creation, encouraging candidates to use their platforms for brand identity and digital advertising. Microsoft, on the other hand, provides more backend tools for managing digital infrastructure operations. Its Power BI data visualization platform, for example, facilitates real-time social media aggregation and analytics. Another product, Pulse, provides audience feedback around events. Microsoft actually supplied all email and livestream technology for the DNC. To help Rand Paul break through the “crowded primary field,” for example, Google put together the concept for a YouTube livestream of a day in his life on the campaign trail. To do this, Paul’s team traveled out to the company’s Silicon Valley headquarters to attend a series of “ideation” sessions. In a similar fashion, Republican staffers at Facebook worked closely with the Trump campaign to help it run targeted digital advertising. “It became clear that candidates could control their message in a much more direct and effective way on social media than on a platform like CNN,” Kreiss says. “I think the biggest takeaway from this study is that technology firms actively shape the communications that candidates engage in — in far more extensive ways than what the public and, frankly, lawmakers and academics have realized. They are driving this,” says Kreiss, who stresses the need for more disclosure and transparency where digital advertising is involved. Kreiss and McGregor hope to answer these questions and more in a new book about the role of technology firms in politics down to the state level. Both agree that the use of digital advertising among political campaigns isn’t slowing down any time soon — and the need for additional studies on this topic is more important than ever. Daniel Kreiss is an associate professor and director of the PhD in Mass Communications within the UNC School of Media and Journalism. Shannon McGregor is an assistant professor of communication at the University of Utah.